The Storm Drain complete drainage system is easy to install and allows maximum flexibility in solving your drainage requirements around the home or light commercial applications. Typical uses include driveways, pools and walkways wherever excess water and erosion are a problem. The systems design allows maximum flexibility in length of channels, corners and intersections. You can connect Storm Drain to Mole-Pipe or 4in. stormwater pipes with bottom or end outlet, Inline collection pit, and prevent leaves or other debris clogging pipes or waterways with the Leaf Guard. The tough durable and lightweight UV stabilised plastic channel includes Portland Grey grate to suit domestic pedestrian and vehicle traffic. Also called spindles, balusters are an important functional part of your staircase. But functionality can still be beautiful with our wide range of designs that will dress up your staircase and take it from simple to stunning. Victorian, modern, traditional and contemporary styles available in Oak, Pine, Maple, Wrought Iron, White Lacquered and Paint Grade to suit any home, any budget. 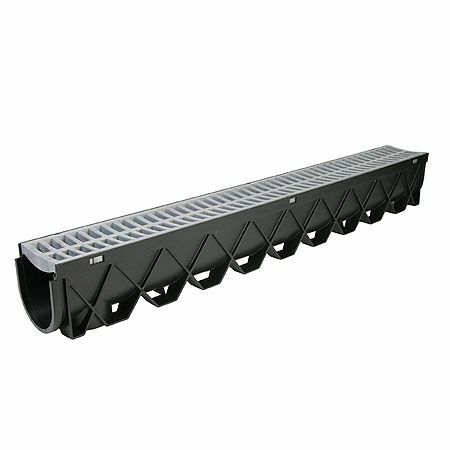 40-inch Storm Drain Channel with Portland Grey Grate The Storm Drain complete drainage system is easy to install and allows maximum flexibility in solving your drainage requirements around the home or light commercial applications. Typical uses include driveways, pools and walkways wherever excess water and erosion are a problem. The systems design allows maximum flexibility in length of channels, corners and intersections. You can connect Storm Drain to Mole-Pipe or 4in. stormwater pipes with bottom or end outlet, Inline collection pit, and prevent leaves or other debris clogging pipes or waterways with the Leaf Guard. The tough durable and lightweight UV stabilised plastic channel includes Portland Grey grate to suit domestic pedestrian and vehicle traffic. 40-inch Storm Drain Channel with Portland Grey Grate is rated 4.3 out of 5 by 17. Rated 5 out of 5 by Mv from Easy to install, durable, easy connections. Easy to install, durable, easy connections. Are adapters necessary to join two of these together? If so, are they included with the product? Also, is a separate end cap necessary or is it included? Joiners are not required for attaching additional lengths of channel sections together. The Storm Drain channels clip together for a quick connection. End Caps and other accessories are sold separately. Depending on the application, you may want to have one End sealed off so that any runoff water is discharging in one direction. Can this item be driven over with a pick-up truck when it is installed. As long as the channels are installed with the required concrete support (4-inches on each side) , the system will support a 5 ton vehicle. Can the plastic grate version be linked to the stainless steel version?